Best for sure on black. 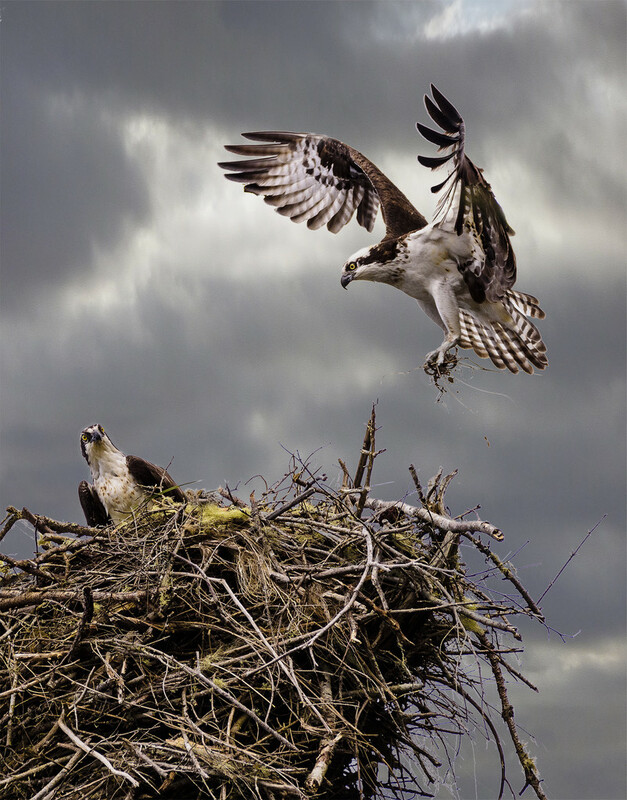 I was ecstatic yesterday when I went to an osprey nest that I had driven by a few days before without a camera and not only was there an osprey sitting on it, but his/her mate was flying in with sticks for the nest. I still can't hold my camera with long lens but was able to get this shot on my tripod. What a thrill! The only problem was that the sky was pure white so I substituted a sky. Does it look realistic? What an awesome capture! a fav. Stunning capture !! Huge Fav! Wow what a capture Jane.....so glad you caught this fab sight! Knew this was yours instantly! Superb!!!!! Amazing capture. The sky looks very realistic, I wouldn't have guessed you'd changed it. Absolutely fabulous shot Jane. If you hadn't mentioned about the sky I would never have guessed. Wow, that must have been amazing to see! Great capture. Wow, Jane, this is magnificent. Just speechless in amazement. You go girl! Oh yes looks realistic great job...............great detail and timing! This is bloody sensational. What a great shot. The choice of sky fits the scene beautifully. I think the only small distraction is that thin band of white around the eagles right wing. If your going to print this, perhaps work that in photoshop. I can't tell at all that you substituted a different sky. What an amazing shot and an easy fav! Absolutely fantastic shot and processing. You should be thrilled! Amazing shot. Nicely done. The sky looks completely realistic -- wouldn't have realized you'd substituted if you hadn't mentioned it and even looking, couldn't tell. This is a fabulous capture! Just truly amazing -- and that you could get it on your tripod is even better as it's a clear as can be. Stunning shot. I would never have known you substituted the sky. Amazing capture and fantastic processing! Awesome capture. Great job on the background. Just looks like a cloudy day. Wow, and awesome job on the sky...would never have known. Just stunning and in due course it will deserve its place on the TT. Absolutely stunning - what a wonderful photo. Congratulations on your Top Twenty finish! Well Done! Awesome to see this so high on TT! So well deserved! Jane, this is one of those images that makes the viewer gasp -- one of those once in a lifetime opportunities, it would seem. The sky is so natural I would never have guessed you had substituted it.